When I'm sad, I like watching the first 25 minutes of "Collateral". When I stumble home after a Saturday night at the bar, I like watching the first 25 minutes of "Collateral". When I wake up in the morning after a Saturday night at the bar and I'm too hungover to write and I just want to watch something while drinking my coffee, I like watching the first 25 minutes of "Collateral". When I arrive home in a depressed rage after a rancid day at work, I like watching the first 25 minutes of "Collateral". When I'm alone and life is making me lonely, I like watching the first 25 minutes of "Collateral". Have I made my point? Let's put it this way - in the last few weeks I've watched the first 25 minutes of "Collateral" a lot. Michael Mann is, of course, my filmmaking idol. He made "Last of the Mohicans" as well as two other masterpieces. I think his cinematic version of "Miami Vice" is frickin' awesome - straight filmmaking, baby. His "Collateral", is a bit problematic in parts, though good overall, but its first 25 minutes? Well, that is just pure brilliance on a level where most men and women dare not dream. 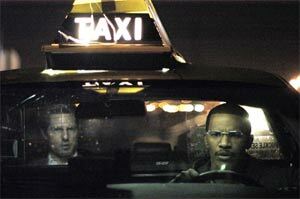 Jamie Foxx is Max, an L.A. cabbie, a temporary job only, of course, because he is "putting some things together." -"How long you been driving?" -(pause) "What other things are you putting together?" It becomes clear he is going to win the bet. They talk some more, personal stuff, getting to know you, but they're connecting. It's clear. They pull up at her building and she gets even more personal, revealing the stresses of her job, a prosecuting attorney. He gives her a gift. It's personal, too. She gets out of the cab and then she returns, knocking on the window. She gives him her card. "In case you want to investigate a Fortune 500 company," she says. "Or argue cab routes." It's wonderful stuff, just wonderful, beyond-my-inane-prose wonderful. On all levels. The next passenger into Max's cab is a sleek-suited, gray haired, stubble-havin' dude named Vincent (Tom Cruise). He gives Max the address. Max says how long it will take. "Okay if I time you?" asks Vincent. "Knock yourself out," says Max. The soundtrack switches to Bach and so now we understand that more serious matters are about to be addressed (what Jiff Ramsey might have termed "the artistic portion of the film"). Max: "First time in L.A.?" Vincent: "No. Tell you the truth, whenever I'm here I can't wait to leave. It's too sprawled out, disconnected. But, you know, that's me. You like it?" Vincent: "Seventeen million people, fifth biggest economy in the world and nobody knows each other. I read about this guy who gets on the MTA here, dies. Six hours he's riding the subway before anybody notices his corpse doing laps around L.A., people on and off, sitting next to him. Nobody notices." Soon enough the cab winds up at Vincent's destination where he explains he has several more stops to make and is willing to double Max's normal intake for one night's work if he remains his cabbie for the whole night. Max agrees. Vincent heads off while Max parks in the alley. Moments later a dead body comes flying off an apartment balcony and crash lands on the cab. Vincent returns. It takes a minute but Max gets it. "You killed him?" "No," replies Vincent, "I shot him. The bullets and the fall killed him." Vincent forces Max to help him get the body in the trunk, they get back in the cab, and off they go for a night of murder and mayhem. It would we well and good to stop the DVD right here but not so fast. There are a few more minutes in which to revel. Mark Ruffalo is an L.A. narcotics detective on the way to the home of the guy Vincent just killed. The passage sounds simple but it is vintage Mann - a slick car with slick rock music on the soundtrack and Mark Ruffalo even has slicked back hair. Is it as crucial as the first two sequences? Well, no, but that's okay. It's like having two fantastic, outta this world cups of coffee and then thinking, "You know what? The hell with it. I'm having a scone, too." It's the dessert. The proverbial icing on the cake. You could talk about how these passages present us people who are different but really the same and how Max's dreams of "island limos" is no more ridiculous than what Vincent's immoral code or that perhaps that very ridiculous notion Max carries with him is precisely what grounds him in the reality Vincent does not understand and so on and so forth. Me? I think it happens to the single greatest illustration of Murphy Law's in the history of society. If you're a cab driver and you score a date with a passenger that is a beautiful, cool lawyer, then the next person in your cab will be an ice-blooded assassin about to go on a killing spree. That's just how the world works. Deal with it. In Atlanta they have a movie theater that shows "Gone With the Wind" 24 hours a day. In New York City they have a movie theater that shows "Breakfast at Tiffany's" 24 hours a day. If I had money to burn I would wrangle up a movie theater that showed the first 25 minutes of "Collateral" 24 hours a day. OK, so you're focusing on the 1st 25 minutes. But seriously ... Collateral turns shark-jumping into an Olympic sport. Foxx's character somehow doesn't realize there's no chance Cruise's character won't kill him? And yet makes no play at all in a public space, like the bar? Including the one play which not Rambo or Bruce Lee could stop, which is a heavy highball glass (which Cruise has conveniently allowed him to have in hand), fastball to the head, by surprise, from 3 feet away? Or to simply bolt for the door? Cruise can chase Foxx down on foot when he's a footbridge and half a covered deck away? Really? A world class sprinter couldn't catch an old slow guy from that distance (at least a 60 second head start), with as many places as there would be to duck into in the average downtown office building. Not to mention that stumpy legged Cruise, catching Foxx. Seriously.